One of India’s leading education groups, Amity is home to over 125,000 students pursuing 300 Programmes in 60 diverse disciplines across pre-school to Ph.D. The 4500 strong faculty have the distinction of filing the highest number of patents in the last years, besides developing the highest number case studies in the last one year. The faculty is also carrying out over 300 sponsored research projects with leading Govt. bodies like CSIR, DRDO and global institutions like Bill & Milinda Gates Foundation. These unique initiatives are reflected in Amity being recognised as SIRO (Scientific & Industrial Research Organisation) by the Govt. of India. 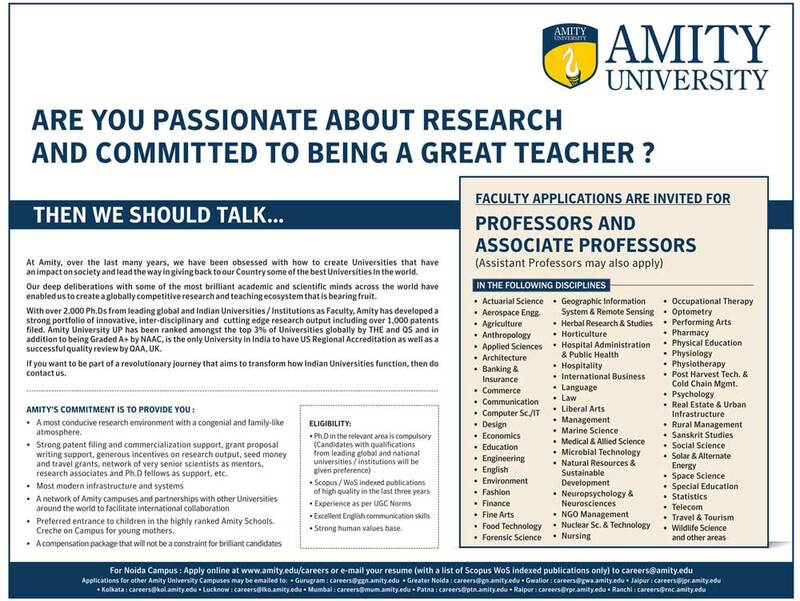 Amity Law School, is looking for dedicated and committed Assistant Professor / Associate Professor/ Professor who believe in institution building and have a passion for academic excellence and quality research. · 1st class LL.B & LL.M degrees from reputed college / University. · Ph.D from reputed University with minimum two publications in reputed refreed journals. 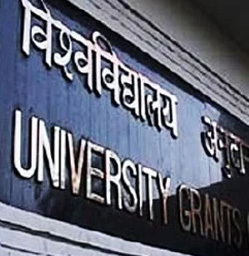 · The applicant must have cleared National Eligibility Test (NET) conducted by the UGC. As you may be aware, Amity Group has been rapidly expanding its activities and institutions, and the pace is expected to further increase exponentially in future as well. We are, therefore, always on the lookout for exceptional professionals at all the levels to explore the possibility of their association with us. Amity Science Technology & Innovation Foundation (ASTIF) is inviting applications from young, bright and competent professionals for the position of Dy Manager/Manager/Sr Manager/OSD. Candidate should preferably be aged less than 40 years and will directly be working with President- Amity Science Technology & Innovation Foundation (ASTIF), Amity University, Noida. Needless to say, the role would be career defining for the right candidate. 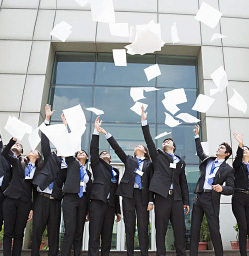 Candidates having completed Full-Time MBA/ PGDM from Renowned Institutions (IIM’s/ XLRI/ IIFT etc.) ONLY need apply. Preference would be given to applicants having completed graduation in Science or Engineering domain (B.Tech/ B.Sc) with atleast five years of qualitative work experience. Applications will be treated in strict confidence and salary will not be a constraint for a deserving candidature. Amity School of Architecture and Planning, Amity University, Noida : Candidates must have done B.Arch, M.Arch/ equivalent from instituitions of national/ international repute and must have got atlest 4 years of teaching/ research/ industry experience. Amity School of Design, Amity University, Noida : Candidates must have done B.Des/ B.Arch, M.Des/ equivalent from instituitions of national/ international repute and must have got atlest 4 years of teaching/ research/ industry experience. Candidates having done Bachelors in Physiotherapy, Masters in Physiotherapy AND Ph.D from institutions of national/international repute with research papers in journals of repute may forward applications for consideration for faculty position in Amity Institute of Physiotherapy, Amity University, Noida. 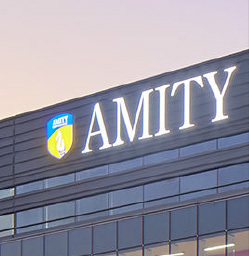 Amity Institute of Public Health, Amity University, Noida: Candidates having done Masters in Public Health AND Ph.D in Public Health/ Allied Area, having teaching/ research/ industry experience and research papers in journals of repute may forward applications for consideration for faculty position in Amity Institute of Public Health, Amity University, Noida. Amity Institute of Hospital Administration, Amity University, Noida: Candidates having done Masters in Hospital Administration AND Ph.D in Hospital Administration/Allied Area, having teaching/ research/ industry experience and research papers in journals of repute may forward applications for consideration for faculty position in Amity Institute of Hospital Administration, Amity University, Noida. We are looking for experienced, competent and committed individuals for the position of Associate Professor and Professor in the department of Amity Institute of Indian System of Medicine for its Noida campus. We are looking for experienced, competent and committed individuals for the position of Assistant Professor, Associate Professor and Professor in the department of Amity Institute of Psychology and Allied Sciences (AIPS) for its Noida campus. 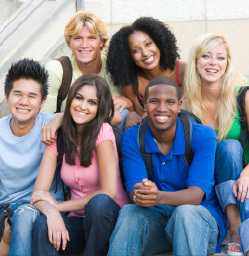 · Ph.D degree in Clinical Psychology from reputed University. · At least 2 publications in SCI/Scopus indexed journals. · Should have guided Research Scholars in Psychology related area. · Minimum of 3 years teaching experience for Assistant Professor, 8 years for Associate Professor and 12 years for Professor in relevant discipline. Applications are invited from highly motivated and bright candidates for the following assignment on a purely time-bound research project undertaken in the Amity Institute of Public Health, Amity University, Noida. 2. At least 1-2years’ experience of research/, teaching / design for study of antibiotic use as well as working with the community. 3. Skills: excellent scientific writing, clear communication skills, proficient in using Microsoft Office and data analysis software. 1. Have prior experience (1-2 years) with data extraction, systematic reviews and research writing and some previous publications. 2. Experience in antimicrobial resistance/antibiotic use/health care delivery/research and working in multi stakeholder project. 3. Be proficient with MS office (word & excel). 4. Have strong quantitative data management skills and demonstrated experience with analyzing data. Interested candidates should submit their application along with CV containing all details of academic qualification, research or work experience, Email ID, personal contact number, and postal address. The details should be sent to smartantibiotics@gmail.com and sushils@amity.edu with CV and cover letter. Applications are invited from highly motivated and bright candidates for the following assignment on a purely time-bound research project undertaken in the Department of Amity Food & Agriculture Foundation, Amity University, Noida. Preferable Experience : Research experience of minimum one years. JRF would be required to work on characterization of surimi industry waste products and development of value added products from the same and other project related activities. Preferable Experience: To evaluate supply chain logistics, cold chain management and to prepare report on process mapping and supply addition interpedently, logistics and custom learning management concepts, energy efficiency system of surimi industry. Prepare report on market analysis of India, food and feed regulation in India, do LCA study and do cost benefit analysis and other project related activities. Applications are invited from highly motivated and bright candidates for the following assignment on a time-bound research project undertaken in the Amity Institute of Biotechnology, Amity University, Noida. “Structural regime characterization of alginate gels in presence of cations & its application”. M.Sc. Or M.Tech. candidates having exposure to polymer chemistry/ molecular modelling with a minimum of 60% or equivalent CGPA. NET (JRF/NET- LS), GATE qualified and those with experience in cellular and molecular biology techniques, Cloning, Immuno-precipitation, Chromatin IP etc. would be given priority. Appointment is purely temporary and will terminate automatically without any notice or compensation on termination of the research project. Interested candidates should submit their application with details of academic qualifications (please attach attested copies of certificates in support of the same), contact information (email id, mobile no., complete postal address) as well as summary of post-graduation project (maximum of one page), within 10 days of this advertisement rsahney@amity.edu with cc to rshylesh@amity.edu. Please mention “Application for JRF – DBT-Biocare – AIB” in the subject line. “Identification of specific small peptide inhibitors binding to G-quadruplex motifs of cellular and viral protooncogenes and telomeric sequences in cancer cells for therapeutic intervention”. Rs.28,000 + HRA for third year. Masters in any branch of Life Sciences & Biotechnology with a minimum of 55% (or equivalent CGPA). Interested candidates should submit their application with details of academic qualifications (please attach attested copies of certificates in support of the same), contact information (email id, mobile no., complete postal address) as well as summary of post-graduation project (maximum of one page), within 10 days of this advertisement ssaxena1@amity.edu with cc to sushils@amity.edu. Please mention “Application for JRF – DBT- AIB” in the subject line. Applications are invited from highly motivated and bright candidates for the following assignment on a time-bound research project undertaken in the Amity Institute of Molecular Medicine & Stem Cell Research, Amity University, Noida. “Understanding epigenetic regulation of chemoresistance pathways in ovarian cancers to develop new therapeutic”. NET/NET-LS, GATE qualified candidates and those with experience in cellular and molecular biology techniques, Cloning, Immuno-precipitation, Chromatin IP etc. would be given priority. Candidates with strong passion for scientific research and eagerness to pursue PhD will be preferred. Interested candidates should submit their application with details of academic qualifications (please attach attested copies of certificates in support of the same), contact information (email id, mobile no., complete postal address) as well as summary of post-graduation project (maximum of one page), within 10 days of this advertisement pagarwal6@amity.edu with cc to sushils@amity.edu. Please mention “Application for JRF – DBT– AIMMSCR” in the subject line. “Development of Novel Curcumin-Folate-Drug conjugates for targeted delivery of drug and curcumin together to cancer and cancer stem cells for effective treatment”. Master Degree in Life Sciences, biomedical sciences, biotechnology, genetics, Molecular Medicine with a minimum of 55% marks or equivalent CGPA. Interested candidates should submit their application with details of academic qualifications (please attach attested copies of certificates in support of the same), contact information (email id, mobile no., complete postal address) as well as summary of post-graduation project (maximum of one page), within 10 days of this advertisement bcdas@amity.edu with cc to sushils@amity.edu. Please mention “Application for JRF – ICMR-AIMMSCR” in the subject line. Applications are invited from highly motivated and bright candidates for the following assignment on a time-bound research project undertaken in the Department of Amity Institute of Molecular Medicine & Stem Cell Research (AIMMSCR), Amity University, Noida. “Assessment of human papillomavirus (HPV) infection status and genotypes among women and adolescents of Sikkim (AHPV-SGS)”. Masters Degree in Life Sciences/ biomedical sciences/ biotechnology/ genetics/ Molecular Medicine with a minimum of 55% marks or equivalent CGPA. NET/NET-LS, GATE qualified candidates and/or experience in molecular biology/tissue culture techniques will be given preference. Interested candidates should submit their application with details of academic qualifications (please attach attested copies of certificates in support of the same), contact information (email id, mobile no., complete postal address) as well as summary of post-graduation project (maximum of one page), within 15 days of this advertisement to bcdas@amity.edu with cc to sushils@amity.edu ). Please mention “Application for JRF- ICMR - AIMMSCR” in the subject line. We at Amity Clinic are looking for experienced, competent and committed individual for the position of Staff Nurse (Male and Female) for its Noida Office. arrange for further medical treatment when needed. health care at the OHC. · Adhere to the duty timings. rotation basis as per company policies. · Preferably B.Sc or GNM (Nursing) from reputed Institute / College. “Development of Diatom Culture Collection, segregation for Nutraceuticals and Application in Aquaculture”. Rs.40,000 + 30% HRA for third year. RA – Ph.D with specialization in Algal Biotechnology / Diatoms. Interested candidates should submit their application with details of academic qualifications (please attach attested copies of certificates in support of the same), contact information (email id, mobile no., complete postal address) as well as summary of post-graduation project (maximum of one page), within 07 days of this advertisement atiwari9@amity.edu with cc to sushils@amity.edu. Please mention “Application for RA – DBT- AIB” in the subject line. Amity Enterprise Learning Solutions seeks a highly motivated and dynamic Sr. Manager – Corporate Sales for its center at Mumbai. This position will be responsible for the sales effort, acquiring new clients and achieving revenue plan from named/new clients in specific vertical/region. He will be responsible to position Amity as the preferred education/learning partner with customer and drive strategic level engagement. Client Acquisition: Achieving revenue targets through customer acquisition in the B2B space. Build substantial account base in assigned vertical/region. Account Management: Achieve account revenue/EBIDTA targets. Lead the end-to-end Account Planning, Drive strategic engagement. Cross Functional Engagement: Work closely with pre sales, product development and delivery organization to ensure new solutions are positioned effectively in the accounts. · 8-10+ years of experience in Solution/Product Sales. Applications are invited from highly motivated and bright candidates for the following assignment on a time-bound research project undertaken in the Amity Institute of Pharmacy, Amity University, Noida. “Smart Hyaluronic Acid - Hydrogel Hybrid for Wound”. Candidate qualified with CSIR/UGC JRF-NET/GPAT/GATE and 1 to 2 year of research experiences is desirable. Interested candidates should submit their application with details of academic qualifications (please attach attested copies of certificates in support of the same), contact information (email id, mobile no., complete postal address) as well as summary of post-graduation project (maximum of one page), within 10 days of this advertisement skrajput95@amity.edu with cc to sushils@amity.edu. Please mention “Application for SRF – DBT-Hydrogel– AIP” in the subject line. Amity University are looking for experienced, competent and committed individual for the position of Executive in the department of Amity Center for Development Co-operation & Alliances (ACDCA) for its Noida campus. Communications & Training, Education, Health, Agriculture etc. “Studies on role of endophytes variation of acaricidal producing plant species NBA22/F1 and NBA18/D1 from North Eastern States”. M. Sc. in Biotechnology from a recognized University. Interested candidates should submit their application with details of academic qualifications (please attach attested copies of certificates in support of the same), contact information (email id, mobile no., complete postal address) as well as summary of post-graduation project (maximum of one page). The details should be sent to spaul@amity.edu with cc to sushils@amity.edu. Please mention “Application for PA– DBT-AIB” in the subject line. Most conducive atmosphere which would inspire and motivate you for developing your potential to the fullest, which you would definitely like to do. Most modern infrastructure and technical support. Salary and perks totally based on your results/achievements. Unlimited opportunities for your professional & personal growth. Working & education opportunities for your spouse & family members. Option to plan yourself how much time you want to spend in teaching, in research, in publication or in consultancy, etc. to meet the API score for desired increment. As India's leading Education Group with campuses in 25 cities in India and 12 overseas campuses, Amity provides you opportunities to work and settle down at a place of your choice. Amity offers crèche facility on campus. 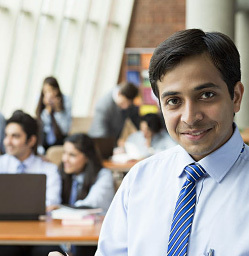 Amity also offers assignments to the spouse depending upon their qualification/experience. To ensure professional growth for its faculty, Amity offers India's largest fellowship & Ph.D programme and provides domain and other faculty training & development programmes through the Amity Academic Staff College.